Political dissatisfaction has been blamed for the spate of violent protests that have gripped the country in recent months. Experts believe they are about to escalate as South Africa heads towards local government elections on August 3. Between January and April, at least 70 service-delivery protests have been recorded in the country by Municipal IQ, an organisation that monitors and assesses the performance of municipalities. Karen Heese, an economist at Municipal IQ, said the latest statistics indicate an upward trend in service-delivery protests, compared with last year. “This could be reversed, but given the intensity of some of the protests, along with the trend towards violent protests in other areas of society – on campuses and at ward councillor nominations – there seems to be a high degree of disquiet about the delivery record of local government,” she said. Heese was wary about the expected increase in service-delivery protests with the approaching municipal government polls. But the SA Police Service is bracing itself for a stormy election period. Deputy national police commissioner Fannie Masemola told the police portfolio committee this week that the ministry had identified intra- and interparty political contestation leading up to the local government elections, along with community protests over service-delivery complaints. Some of the major threats related to civil unrest. Masemola identified 10 hot spot areas – three in Gauteng, three in KwaZulu-Natal, three in the Eastern Cape, and one, Grabouw, in the Western Cape. 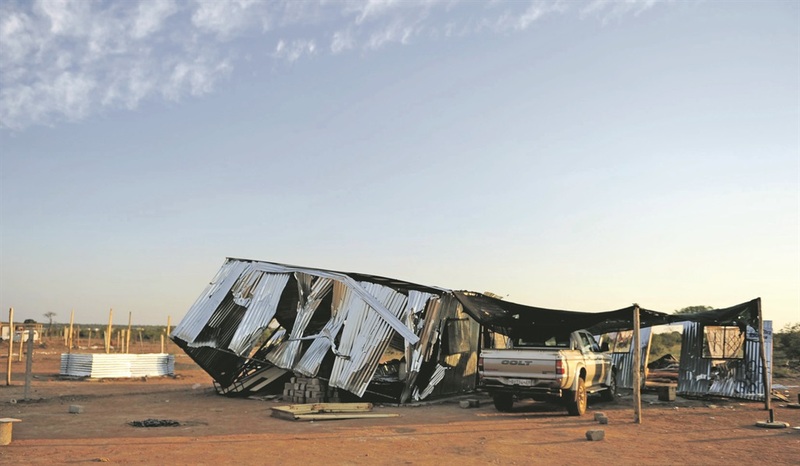 Grabouw’s residents were unhappy with evictions and the removal of illegal structures. Masemola said 104 public-order police were deployed in the area. The three hot spots identified in KwaZulu-Natal comprise two in KwaMashu men’s hostels and one in Wembezi in Estcourt. Wembezi has been marred by violent protests recently, while the men’s hostels in KwaMashu have reported high levels of violent crimes, with some resulting in fatalities. Masemola said the deaths were politically and criminally motivated. About 108 public-order police officers were deployed in Wembezi and KwaMashu. In Gauteng, the three hot spots identified were Ennerdale, Kagiso and Hammanskraal, he said. In Ennerdale alone, there have been six service-delivery protests in the past four months. This resulted in the deployment of 68 public-order police officers. Among the four provinces pinpointed as having the highest number of service-delivery protests, Gauteng took the lead, with 26% of protests reported in the province. Heese said this was typical for Gauteng, “for most years, and it is due to its high population”. The Eastern Cape followed closely at 24%, with its three hot spot areas being Lusikisiki, Umthatha and Alice. Many of these protests took place in informal settlements and underdeveloped areas, where service delivery remains a major challenge. Paul Mashatile, the ANC’s provincial chair in Gauteng as well as the MEC for human settlements and cooperative governance, expressed concern at the increasing spate of protests in the province. 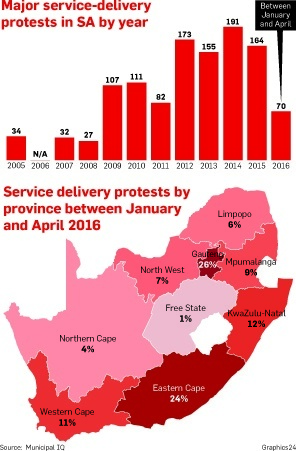 While Municipal IQ did not provide the breakdown in the number of protests before and during the last local government elections in 2011, it does have statistics that show that there were 82 major service-delivery protests during that year. “In 2011, we attributed this to electioneering. This brought politicians closer to communities and the improved engagement appeared to mitigate the protests,” said Heese. Are politicians engaging more with communities in the lead-up to the polls? Do you think there will be a reduction in violent protests after the municipal elections?